I am aware that some rail transport enthusiasts and supporters are questionning the appropriateness of the views that I am advancing in this discussion. Some are saying: "Cayford should keep quiet, the Britomart Tunnel is all that will be funded. If he asks for too much nothing will even happen...." sort of thing. Fair enough. That's a point of view. 1) Auckland's state highway network - love it or hate it - was planned more or less completely in the 1960's and 1970's. Yet it is only today that the last sections of it are being built. That network was planned to accommodate development and expansion of Auckland, both in terms of land use, population and economic development over a long period of time. As money became available, the top priority sections of that network were built. 2) Auckland's current railway network is pretty much as it was designed almost a hundred years ago. A few new bits have been planned. The Manukau Spur is an example. The Airport Rail link is currently being planned. And a designation to protect the proposed Britomart Rail tunnel section - which was conceived in the 1920's - is to be planned in detail and protected in work that is happening now. 3) But it is piecemeal compared to the planning that is needed if Auckland is going to back itself over the next 30 - 50 years with an electrified rail system, and commit to it. 4) Perth decided to go down the rail route, and decided also to get major bus services out of its CBD. There are still inner CBD bus services, but the line haul bus services now don't go into the centre of Perth. Instead commuters transfer to high capacity electric rail services to get into the CBD. You can see how pleasant Auckland CBD would be without buses during the recent strike. But that can only happen if rail services are commensurate, and planned. 6) I won't go on in this blog, but the guts of my argument is that Auckland CBD needs a network of rail services. Not just a single line around the edge. This network needs stations at major destinations including Aotea Square, University/AUT, Hospital/Domain. Otherwise we will just continue being a little - little city, with hundreds of diesel buses cluttering up the streets. This network won't be built in a day, just as Auckland's state highway network wasn't. But it was planned for the long term. I believe that the strategic planning to support the Britomart Tunnel designation should include preliminary work on the CBD rail network. We may build the Britomart Tunnel and link first, but let's have a better idea about how it will connect with other parts of the rail network. We had an interesting and lively meeting at Devonport last week. Organised by local councillor Chris Darby, it attracted a big attendance. 250+ according to the NZ Herald report. The purpose of the meeting was to allow spokespeople from ARC, DOC and the Auckland Health Board to provide information about the Sea Slug/dog poisoning incidents that have occurred on North Shore beaches (notably Cheltenham and NarrowNeck), and also in relation to marine effects of Brodifacoum poison drops that have occurred on Rangitoto. I won't traverse what happened at the meeting, save to note that it was my job to wrap up the meeting, and to point to what needs to happen next. As part of that I observed that there will likely need to be a further meeting - due to the level of public interest - but also to answer questions that were raised from the floor, and which were not addressed. 1) That information/advice is required in relation to the effects of brodifacoum in the marine environment, and the extent of its effects on/in the marine food chain. 2) That appropriate public information and advice is required for users of Narrowneck and Cheltenham Beaches. 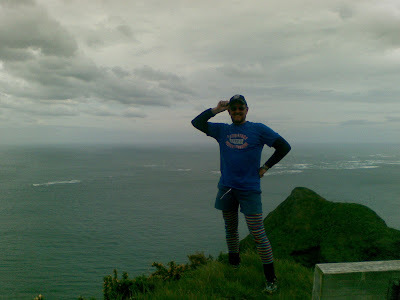 - the North Shore Surfcasting Club was well represented in the attendance, but only one asked a question (in relation to his son who was fishing off Rangitoto rocks at the time of the/a drop. Several comments were made to me. By the secretary of the club: "a mate of mine was fishing 50 metres off Rangitoto at the time. It was like a severe hail storm. His boat was 'half full' of pellets. Another guy I know was fishing 150 metres off shore. He got hit too. We want to know about snapper fishing there now...." . Another fisherman: "I go there fishing now anyway, and catch and eat the snapper I catch, but I am a bit worried. What's the story...?" And another fisherman: "a mate of mine is a crayfisherman at Kaikoura. He has visited the place where that truck full of rat poison crashed. He says what's odd is that the area is completely free of any form of life - no insects, no limpets, no crabs, nothing. Whereas on either side its all good. What does that mean for Rangitoto...?" - another man told me he lives near Warkworth and claimed that the helicopters - for the first drop - had been loaded somewhere there, and then flew to Rangitoto with open hoppers, dropping some pellets on the way. He understands that for drops 2 and 3 the helicopters loaded at Motutapu. He believes that pellets were dropped - accidently - between the loading point (for drop 1) and Rangitoto, and that there has been adverse effects. That is at the heart of what I learned. 1) I would like to know exactly what happened in regard to the drop operation: how many helicopters were used for each drop? where they loaded? whether hoppers were covered or uncovered? whether records were taken in regard to whether pellets dropped in the sea at any point. 2) Please provide information as to the fate of brodifacoum that is dropped in the sea, and what is known about how it may enter the marine foodchain. Also what is NOT known and is being researched. 3) Please provide me with a copy of the ARC consent for this operation, and the related conditions. 4) Please provide me with copies of any monitoring or related reports that have been prepared subsequent to any of the drops, whether by ARC or DOC or agents acting for either institution. Finally, I would appreciate advice as to how the general requests I made at the meeting (summarised above) can be met. I would also appreciate your advice as to what NSCC's role should be in regard to ensuring its beaches are kept free of health risks - such as washed up sea-slugs. So. Those are the questions and requests for information that I have put in front of the responsible ARC officers. When further information comes to hand, then it may be most appropriate to set up a further public meeting. You will be kept advised. 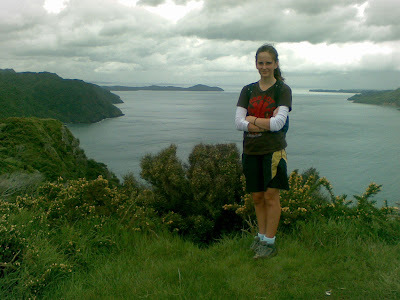 Isn't Aisling's death a stormwater wake-up call for Auckland? There's been a little bit of news coverage of what Waitakere City Council - councillors and staff - must be going through after Aisling was found drowned in one of Waitakere's stormwater pipes. There but for the grace of God go many of Auckland's Councils I think. Stormwater has always been the "poor relation" of Auckland's waters. This gives a good idea of what happens when a stomrwater pipe surcharges in heavy rain (shower gone past in this picture, but overland flow continues as land drains). The bulge of water will be surging from a stormwater pipe below ground. Here, there is an overland flow path above the pipe. 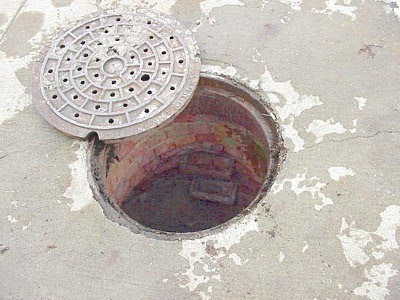 Stormwater manhole lids are locked into place by lugs. The lids turn to lock. But in my experience stormwater lids routinely "pop off" or "pop open" under the pressure of stormwater when pipes are surcharged (full). Who will control this infrastructure in Auckland's SuperCity? This diagram gives a good idea of what a stormwater pipe looks like, and its connections to manholes and manhole covers above. (This image is actually a sewer pipe, but the principle is the same...). The diagram also shows some of the problems that arise, like cracks in the pipes, like tree roots getting in. All of these problems need to be managed. The pipes go where water goes. 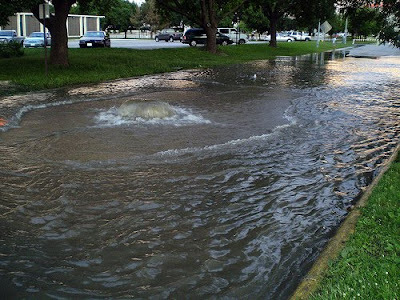 Under present arrangements, stormwater pipes are controlled by Auckland's councils. Some Councils have integrated the management of stormwater infrastructure with that of water and wastewater. Three water strategies are what the modern world does. It is working reasonably well. But obviously not perfect as the Waitakere experience clearly demonstrates. But under present proposals, Watercare will ONLY pick up water and wastewater. 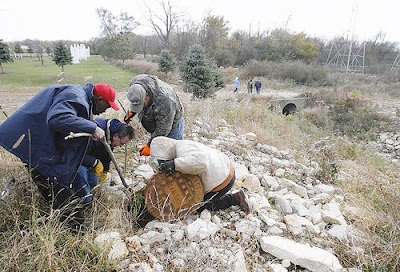 Nobody has said anything about what will happen to stormwater infrastructure. The unseemly squabble over TV coverage of a few games of rugby is the public tip of a political iceberg that threatens Auckland interests. We all know how much the Government needs the support of either Act or the Maori Party in order to stay in power and get its policies enacted in Parliament. Managing this balance requires a certain amount of horse-trading - or musket-trading in the case of Maori it seems. Recall the issue of Maori seats on the Super City council. There was a huge public majority in support of this idea. I was one of the thousands in the Queen Street Hikoi. It was popular. The Maori Party spoke out strongly in support, but the Government was wobbling. Not consistent with policy, apparently. Then Rodney Hide threatened to throw his toys out of his cot. An issue of principle - he said. Elected councillors should be elected by democratic process - he said. Seat allocation was undemocratic - he said. And threatened to resign. (Has he threatened to resign over the way Maori seats are allocated in parliament...?). Anyway, the Government gave way and ditched Maori seats on the Super City. There was a bit of a grumpy backlash from the Maori Party about this, but it went quiet pretty quickly. I suppose we should have all been aware that a few muskets might have been traded in some quiet deal behind the scenes. And then suddenly we found out what it was. The sudden and rather odd change in Auckland's southern boundary. Looking at a map, what this means is about 14,000 hectares of land around the Hunau Ranges, the Mangatawhiri and Mangatangi dams, three regional parks, and an attractive chunk of Firth of Thames coastline get passed from the jurisdiction of Auckland Regional Council, to Waikato Regional Council - aka Environment Waikato. For me, and for many of us, this proposal came out of the blue. Not like the Northern boundary change at Rodney. The reason for that was so transparent. Greedy developers and land-owners wanted freedom to develop away from the careful and long term planning objectives and policies of the Auckland region. But why the change in the Southern boundary? What could be the plan? Information about this has leaked out in variety of ways. It's part of the price of losing the Maori seats on Super City. Fundamentally it is about Government wanting a tidy majority. Materially it is about Tainui and water. It is about Tainui getting control of Auckland's water supply. I won't bore you with the details of the 2007 Tainui Settlement, but the essence is this: "The key principles of the settlement, Te Mana o te Awa and Mana Whakahaere, confirms the overarching purpose: to ensure that the protection of the health and well being of the river is paramount. Through these principles and this settlement, Waikato-Tainui and the Crown aim to enter a new era of co-management of the Waikato River at the highest level....."
There is the "co-management" word. Environment Waikato is a critical player in all this. Tainui have long been angry at the declining health of the Waikato River. And fair enough too. The dairy industry in particular, and twenty or so municipal sewage discharges, have degraded water quality and affected the health of important food sources such as tuna (eel), koura and water cress. Environment Waikato has been slow to respond, but it's hard when the dairy industry is so important to New Zealand's economy, and so powerful. Both Tainui and Environment Waikato have been frustrated, and have advocated action by Government. 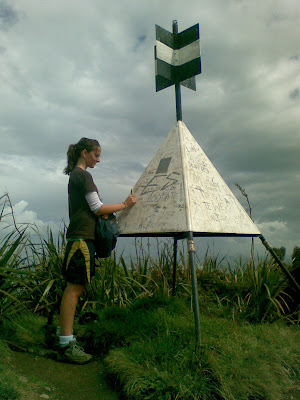 A little further into the 2007 Settlement we find: "It has been agreed that there will be a financial package from the Crown to provide for cultural and economic loss, implementation and clean up funding, and funding for cultural, educational, economic, social and heritage initiatives for Waikato-Tainui...."
both Waikato-Tainui and Crown have in regard to the issue of ownership. The focus is still about management of the river, but protects Waikato-Tainui’s position on ownership should it become relevant in the future...."
Should ownership become relevant in future. I think ownership has suddenly become relevant. Government has come up with a win-win-win scenario with the Southern boundary change. It gives something significant to Tainui - through its relationship with Environment Waikato - and thereby keeps the Maori Party happy. And it hasn't had to enforce anything unpopular with the dairy industry. Fantastic. And the losers are...? Auckland and the Waikato River. The Hunuas drain into the Waikato River. But they would be the cleanest and least dairy polluted tributaries of that huge river. Hardly a target for a Tainui clean-up. No. I think this has much more to do with ownership, control and financial settlement. I think this because Auckland will lose control of more than 50% of its water supply. The pristine protected catchments of its Hunua mountain water supply, and the dams, will be transferred into a co-management deal between Environment Waikato and Tainui. Tainui will be in the position to clip the ticket on every litre of water that flows to Auckland from catchments it will then have under its co-management control. It amounts to privatisation of Auckland water. The ripples from this dirty little deal are already spreading and infecting Maori relations and partnerships in other parts of Auckland. Because that is what happens when one iwi gets too many muskets. Pakeha clamp down on other iwi. The Queens Wharf development is an example. Publicly agreed design criteria call for "Pacific Culture" to be showcased there. That would open the door to some ideas from Ngati Whatua, or other Maori thinking in Auckland. But can you find any of that in the winning designs? Not! Auckland will be the poorer without the enrichment that will result from creative involvement and inclusion of Maori ideas and imagery in its waterfront places and spaces. Maori are being excluded from the Auckland's waterfront. It's called utu. Regional Revenge. Ripples from Government's proposed Southern Boundary deal with the Maori Party will spread far and wide throughout New Zealand. And they will make waves for a very long time, because Maori and Pakeha both have very long memories for this sort of thing. You won't solve grievances by creating other grievances. The slogan: "Say No to No Say" was invented by Boase Massimi Pollit (ad agency) in 1984, when Thatcher's Government decided - without mandate - to abolish the much loved (and presumably hated by some) Greater London Council. BMP came up with the slogan under commission by the GLC, defending itself vigorously. Anyway, I was living in London at the time and well remember another billboard campaign advert run by GLC which simply said: "Fare's Fair". This promoted a 50P flat fare. You could go anywhere in London for a while - by bus or tube - just by paying 50 Pence. It was great. Patronage rocketed. Tube travel was a bit uncomfortable because the tube trains were crammed. Especially at rush hour. But it was very popular. At the time I was working in partnership with a couple of others making campaign videos. One project was called "Early Warning at Work", which was made for a consortium of trade unions wanting a discussion trigger video for worker meetings. There was a lot of globalisation of British industry going on at the time. Major companies were parcelling up component manufacture and getting stuff built abroad by low paid workers on piece work. Workshops and factories were being shut down across Britain. Workers were losing their jobs. The idea behind the video was to encourage workers to be watchful - check out the consultants on the shop floor with clip-boards, watch the trials of new equipment, be aware when foreign delegations visit. All that sort of stuff. Anyway, the thing was that the video was funded by GLEB - the Greater London Enterprise Board. Supporting local creative enterprise! We had to sign a contract about what we were going to deliver and for how much. What you would expect. What was really interesting about the contract - so interesting that I've kept it in my archives - was the clause that was forced into it by an Act of Parliament. The clause said: "We, the undersigned agree that the words 'Say No to No Say' will not be used in any form in any item produced under this contract." Don't you find that fascinating? Almost Orwellian. 1984. Happy days. Where is Auckland's "Pacific Culture" in Queens Wharf designs? Interesting that none of the 5 short-listed designs for the Queens Wharf design competition reflect or celebrate - as far as I can see anyway - Auckland's Pacific culture. 2. To achieve a high quality work of contemporary architecture, heritage and public open space which celebrates Auckland’s maritime and Pacific culture and New Zealand’s innovative and creative culture in an exemplary way that attracts local, national and international acclaim. 3. To create a distinctly Auckland place that showcases our harbour environment, history, diversity and Pacific culture. But none of those got through the judging process. This process included selections from the Panel, and then a final selection decision by ARC, ACC and Government representatives. And no mention is made of this requirement in the panel's further guidance for Stage 2. So. Do these criteria also apply to the panel and those who are making decisions? Or are they there to appease.... encourage Pacific culture related designs for appearances sake... and lack real commitment and force when it comes to implementation... ? I am asking these questions internally within the ARC, but not getting very far. The Hon Stephen Joyce should be feeling well and truly in a corner over Auckland rail now. Hopefully he will see sense and make some appropriate announcements very shortly. Can't imagine that the Government would like the SuperCity election campaign next year to turn into one where every candidate campaigns against central government transport priorities! I know there's a lot of enthusiasm for the Britomart Loop - because it will get rid of the bottle-neck and all that - but there are some major planning issues around CBD rail that should be in the public domain. Today, Britomart is the only railway station in the Auckland CBD. Its configuration constrains the Auckland rail network’s passenger carrying capacity. The Britomart Rail Tunnel project could release this constraint, and add one, two or three more stations, depending on which historical plan is considered. These plans were all prepared before the Auckland region decided to accept a Northern Rail connection to the North Shore through a harbour tunnel, as its preferred alignment and mode for the second harbour crossing. • A key objective for Ontrack is to increase rail freight, which in Auckland shares the network with commuter rail services. The implications of this conflict needs to be understood, and options for managing it considered to avoid rail freight services inhibiting the development of high capacity and high frequency passenger transport rail services. • While the Britomart Rail Tunnel project has been around in some shape or form for almost 85 years, limited strategic planning for Auckland CBD Rail has been carried out recently that takes account of the provisions contained in Plan Change 6 to Auckland’s Regional Policy Statement, let alone a possible rail connection to the North Shore. ARTA (Auckland Regional Transport Authority), which now has the responsibility for planning Auckland’s passenger transport service network, has not conducted the necessary comprehensive strategic planning to support a NOR for the Britomart Rail Tunnel project. • Auckland City Council will need to be involved in the planning for the size, location and functionality of railway stations within the CBD area, as well as bus/rail interchanges that might be required on the CBD periphery. ARTA, ARC and ACC will need to coordinate and sequence land use changes, the staging of transport infrastructure construction, and the roll out of new rail services – in order to optimise integration outcomes. There is a need to properly coordinate these planning processes in accordance with RLTS provisions, which suggest a duty to establish an appropriate “CBD Rail Steering Group” including ACC, ARC, ARTA and Ontrack. • The Auckland CBD has changed immeasurably since the Britomart Tunnel was first conceived almots 100 years ago. Other major destinations have emerged: Hospital, Domain, University. If the goal is to reduce the need to take a bus into the CBD - because there is good rail - then these other destinations need to be served by an underground CBD rail network, of which Britomart Tunnel is one corridor. ARTA are engaging with this planning. It needs to be public. These questions need to be addressed thoroughly in an Integrated Transport Assessment process in accordance with RPS provisions, culminating in the development of a publicly agreed long term Auckland CBD rail network plan, before Ontrack can legitimately proceed to issue a Notice of Requirement for the Britomart Rail Tunnel project. A couple of years ago I attended Newman's presentation: TOD, POD and GOD. He'd gone beyond Transit Oriented Development, and Pedestrian Oriented Development - to Green Oriented Development, and was talking about green roofs and energy efficient housing and the like. Good stuff. Here is Auckland, there is a head of steam up over TODs, we have the Northern Busway, and we have some successful rail infrastructure. Which needs electrification and extension and further development. That's all good. But public transport infrastructure needs to be linked into land uses to form a good TOD. There are a few of these in Auckland, but there's not been much in the way of PODs. New Lynn and Newmarket are among the most successful TODs. Waitakere City Council has gone to exemplary lengths to get the New Lynn development up. This is a TOD (because you've got rail and bus services connecting there, and driving the development), but the council has also strived to make the whole environment pedestrian friendly by creating a trench for the rail and establishing more pedestrian oriented paths and spaces. It's not totally successful, because there is still - in my opinion - too much provision for the private car. Newmarket is a pretty good TOD too. And its pedestrian environment is OK, but again, there is execessive emphasis on the car, and not enough on pedestrian and cycling amenity. Auckland reaps what it sows. Needless to say, that sort of sentiment expressed in a single policy statement is all well and good, but it needed to be fleshed out somewhat. Easy to ignore. And at the time it would be safe to observe that officers were not full of ideas about this stuff either. Auckland is so far behind the eight ball on things like this. You will see in there, in terms of Transport Carbon Reduction - based on the work of VTPI (Victoria Transport Policy Institute - based in Canada - which is extracted and quoted in the paper), a region like Auckland can expect a 20% to 40% transport carbon reduction through ensuring that the transport/land use patterns of existing town centres, DOES shift to a much more pedestrian and cycling oriented transport pattern than now. But at present, my sense is that the policies in place in the RLTS and the performance targets, don't drive that outcome hard enough. • Reduces the need to travel by car by encouraging more employment/business/retail/community facilities close to residential areas and the opportunity to walk or cycle. This pattern needs to foster a critical mass in terms of population to support a range of small local enterprises. • …(the need to)…Enable a regional land use pattern where local areas have sufficient critical mass in terms of population to support a range of quality and accessible community facilities and services, including health facilities and education and training to support employment choice. • Proportion of private motor vehicle travel compared to sustainable transport. • Community resource accessibility index. • Percentage of population within identified growth areas. • Percentage of employment within identified growth areas. • Fuel consumption per capita. • Means of travel to work. • Average length of journey to work. • Percentage of population within 500 metres from a train station or transport hub. • Activity mix in centres and pedestrian traffic (measure of vibrancy in centres). • Total urban footprint and measures of land use (industrial, residential, business etc). ... while some of these relate more purely to land use, and might be better placed in the RPS, a good number of them are better placed in the RLTS, and lead to the desirable outcome that there be targets (5 year, 10 year, 20 year, 50 year) for these measures, which are indicative of the implementation of the principle of the ARGS. They can be added to, for example, by including a mode share set of targets as well. • Subdivision codes and traffic engineering codes and parking requirements are often in conflict with good urban design and TOD-type development…." • To avoid the worst impacts of climate change and rising oil prices we need to rapidly reduce the use of carbon-based fuels, develop ways of recapturing carbon, facilitate a shift to the widespread use of renewable energy, and radically reduce energy use. Aucklanders will also need to significantly reduce their dependence on the private motor vehicle, and redevelop their urban form and rural centres into a compact urban form. • The RLTS review needs to find ways to reduce CO2 emissions from the transport system. I note that in the current RLTS the "Emissions" appendix explains that one of the reasons for increased emissions is that under the strategy, people will actually take on average slightly longer trips: "Longer average vehicle trips are due to higher vehicle speeds. The combined effects of significantly more investment in roading, public transport and travel demand management, result in higher speeds, which allows people to travel further in the same time period…." . In part this is a consequence of not achieving the sort of urban form, density, and POD transport mix, that will cause a shift in this. I have prepared a set of policy recommendations in the paper, which you can see at Chapter 5. In retrospect, I think priority should be given in the RLTS, to bringing out the ITA (Integrated Transport Assessment) policy tool, and having it triggered earlier/lower down the hierarchy in the consenting process. It needs to include some of the targets and performance/assessment measures mentioned above. This would in part achieve better TOD outcomes, but needs also to drill down into the POD outcomes. Finally, last but not least, I note that - for example NSCC (North Shore City Council) is reviewing its pavement/footpath strategy at present. But this all rests on the bedrock of "Infrastructure Design Standards Manual". The IDSM. This manual - and the engineering standards it enshrines, is the root of many of the anti-cycling and anti-pedestrian and pro-car outcomes that we see. In my view the RLTS needs to require a review of these IDSMs as they relate to Auckland Region's town centres, so that there is a shift in emphasis. The drive for this review is bring about a mode shift, by making pedestrian and cycling environment much more attractive and safer than now. This material probably needs a bit of rationalisation and tidying, but gives an idea of where I think Auckland (and SuperCity) needs to be going if we seriously want to change the amenity, and public experience of our town centres. 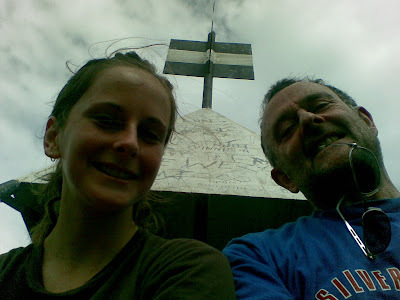 Along further we could see a higher peak, "surely we'll be walking around that one..."
The first part of our walk was along the Kura Track along a beautiful valley with Nikau forest, and I think there were 4 or so river crossings. These get big when it rains hard - because the river system flushes very quickly. 4) .... and you MUST go and add your name to the Lake Road cycling lane petition (see bottom). 27 Sept: Our thoughts and best wishes go out to the cyclists and the families of the victims of the accident on Tamaki Drive on Saturday.This is an all too familiar tale that many of us are acutely aware of. As "the voice for cyclists" in Auckland, Cycle Action has been active this weekend in ensuring that the people who choose to cycle are fairly represented.Our concerns have been reported in a story in the Sunday Herald, and another will be in tomorrow's NZ Herald. Plus, there will beinterviews on Breakfast and Sunrise TV (Channels 1 and 3) at 7:10am.There will also be a radio interview on Radio Live Breakfast showand Barbara Cuthbert will be discussing the issue with John Banks onMorning Report at 8.10. BFM Radio also interviewed Barbara Cuthbert on Monday morning. 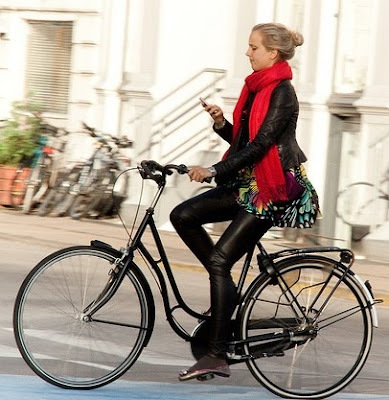 7) NZ Herald: What Can be Done to Make Cycling Safer? 8) TV3 Campbell Live: Auckland – A Cyclist's Nightmare. (Mon 28 Sept)Interview with members of Pickled Peddlers group. . Also interview with Bicycle NSW CEO Alex Unwin about conditions for cyclists in Sydney. This one's in Devonport, North Shore. And this one's in Copenhagen. I just put the camera down and let it run for a while. This petition is for everybody who believes that cycle infrastructure - which allocates road space to cyclists - is an essential step in making cycling safer in Auckland. The lane is on Lake Road between Devonport and Takapuna. It is unfinished, but soon will be. Please follow the instructions below and go there, and add your name. The Lake Rd cycle lanes are under threat again. Responding to a group of Devonport residents who wrongly believe the cycle lanes cause motorist delay, North Shore City Council is reviewing whether the cycle lanes should be removed. We need to send a strong message to North Shore City Council to let them know the cycle lanes MUST stay. Please help us by signing the on-line petition, and forwarding this email to your friends and colleagues, especially if they live on the Shore. You could also add the petition link to your Facebook page, send a tweet, or anything else you can think of to get the word out. So go to it, if you haven't already. 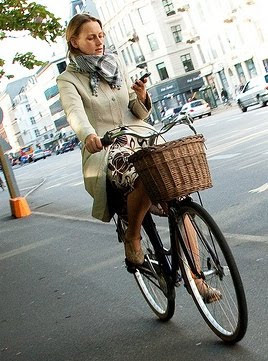 Remember, you can tell how civilised a city is, by the amount of cycling. 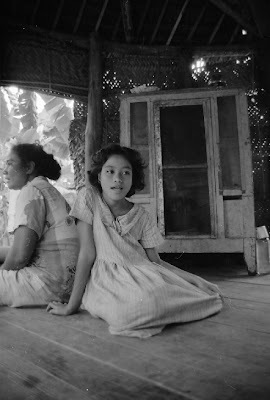 The purpose of my research project is to consider the matter of housing for Pacific Island people in Auckland, with reference to the Tamaki project. 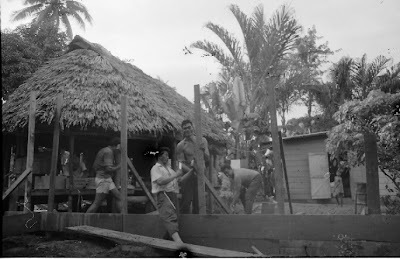 This photo shows a house being built at Vailele. The tall guy is my friend's father. He was the matai of the village. Mr Taufaga. 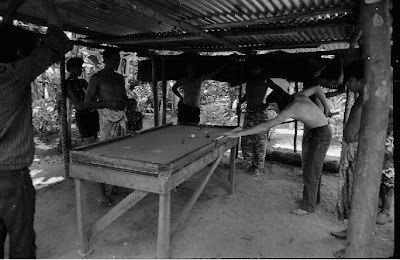 Here's a mate playing pool in one of the common areas of the village. The project got me thinking. It's all about how urban life can be designed around another culture. We assume that the European idea is the one that everone will like. 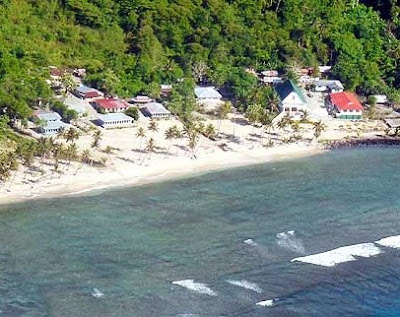 Everywhere you go on Samoa, the village has a malae, an open area for all sorts of activities. Like volleyball. "...Of the 200,000 Pacific Island people living in Auckland, about 30% live in state housing provided by Housing New Zealand. 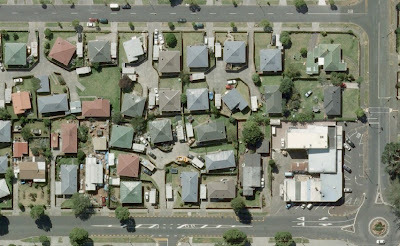 Pacific Islanders account for 50% of the population of the South Auckland – Tamaki suburbs of Point England, and Glen Innes East and West, many of whom occupy state houses in areas which are targetted for redevelopment. This research has considered the challenge of housing South Auckland Pacific Island communities, and has arrived at various conclusions. Firstly, because Pacific Islanders have the lowest rate of home ownership of ethnic populations recorded in the NZ census (22% compared to the national average of 53% (NZ Census, 2006)), and noting that this follows a drop of 8% points in home owndership over the last 10 years, it is highly likely that demand for State Housing by Pacific Island families will continue, if not increase, in future. The current impediments to home ownership of low incomes and job security are unlikely to improve quickly given the current economic climate. The present research notes that previous policies of pepper-potting and heterogeneous integration for Pacific Island peoples have not been successful, and notes the growing evolution of homogeneous Pacific Island communities and neighbourhoods. 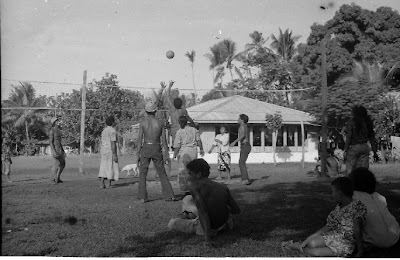 We therefore conclude that not only should provision be made to house Pacific Island families in state housing into the foreseeable future, we also conclude that every effort should be made to ensure the establishment of homogeneous Pacific Island communities and neighbourhoods in such housing. The theoretical basis for this recommendation is the environment-behaviour research carried out by Amos Rapoport into urban settlements. His findings are in many ways a cultural generalisation of the Western world view of the New Urbanists. We find that the approach of the New Urbanists, while there is much to recommend it, was not born out of an understanding or appreciation of Pacific Island culture and settlement patterns. The core findings of this research are drawn from indigenous planning research (including the findings of three University of Auckland research theses by Tongans) and an analysis of images of Pacific Island settlement patterns over the past forty years. 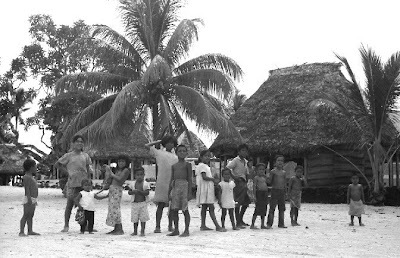 This research demonstrates the significance to Pacific Island culture and peoples of the malae (akin to the Maori marae); ceremonial activities involving the extended family which place specific demands on buildings; and the importance of shared communal space around homes for social activities. All of these are critical components of Pacific Island culture which are given effect and enabled by the design and layout of Pacific Island urban settings. Literature research and an analysis of images of Pacific Island homes in the Maybury Block of Point England, Tamaki – South Auckland, have enabled the identification of patterns of adaptation, where aspects of Pacific Island culture have been introduced into South Auckland, by the creative and determined efforts of Pacific Island locals. These include the use of garage buildings for ceremonial related activities plus additional accommodation on privately owned sites, and caravans, façade decoration and lean-to structures on state housing sites. We also noted the proud placement of a Tongan church in the middle of the Maybury Block. In conclusion, it is our view that Housing New Zealand has a social and cultural duty to properly understand the role that Pacific Island vernacular urban design has in shaping the behaviour and education of Pacific Island people, in order to design and build the most appropriate urban landscapes for Pacific Islanders in Auckland...."
If you are interested in this, you will have seen the results in NZ Herald last week of Stage 1. 5 Designs were selected, and 3 Design Teams. For the most part the winning designs were prepared by small design consultancies. "...To participate in Stage 2, ‘Stage 1: ideas or concept plan proposal’ finalists will need to work with a team of proven capability. Finalists may propose their own consultant team and submit this team for approval, or join a team submitting a satisfactory team entry from the ‘Stage 1: team proposal’. ‘Stage 1: team proposal’ finalists are eligible to participate in Stage 2 in their own capacity but are also allowed to form a working relationship with any ‘Stage 1: ideas or concept plan proposal’ competition finalist. Any changes of membership from their Stage 1 team proposal must be submitted to the Project Sponsors for approval. Stage 2 contestants are expected to provide all the necessary consultancy services, including but not limited to the architectural, landscaping/urban design, civil/structural and building services to complete the design of the proposed development. The Project Sponsors intent to separately appoint consultant services for regulatory planning, quantity surveying, project management, and heritage review and advice..."
So you can see that what will happen is that small design entry people are being encouraged to form partnerships with recognised teams - so they can offer the capability necessary to take design ideas forward toward implementation. I am advised that some 25 Team Entries were received in stage 1. The panel has announced the top teams, and 3 of these have generally been named in the media. However the panel has also named a further 4 teams - those who did the next best - as satisfying their criteria. Winning contestants can also choose to team up with any one of these. This means that the 5 winning entries have 7 teams to choose from. And it appears that the 3 top teams could also choose to put up their own entries at stage 2. They don't need to team up with any of the winning entries - unless they want to. So. There could be a maximum of 8 entries at the end of stage 2 - one from each of the original 5 winning designers, and one from each of the winning teams. But it seems likely that there will be a joining of forces. · creating a “destination” at the northern end of the wharf. In respect of the extensive view protection area occupying the southern part of Queens Wharf (as indicated on the Auckland Regional Coastal Maps), the advisory panel considers that full public access to the wharf will make available a new range of extensive harbour views which have not previously been possible. In the changed circumstances of public access to the wharf, there will be a need to provide shelter to and activation of southern end of the wharf. The current view protection provisions would unnecessarily restrict opportunities to do so. It will be important for Queens Wharf to offer an inviting public realm experience throughout the year and in a diversity of situations, ranging from large scale to micro events, and during periods when the wharf is minimally active. Queens Wharf and its harbour setting offer experiences of a large scale. The presence of cruise ships will add to this scale impact. While these large scale conditions will be a distinctive aspect of the visitor experience, the individual visitor should not feel overpowered. Development of the wharf should also offer experiences at a more intimate scale. Opportunities for developing a balance between ‘prospect’ and ‘refuge’ should be explored by Stage 2 design teams. The wharf needs to allow for multiple activities to take place simultaneously, and to be developed in a way that will promote this. People using the wharf should be able to become aware of and appreciate activities associated with a variety of uses, including associated pedestrian and vehicle movements. At times when cruise ships are not using the terminal it should be possible for the public to move seamlessly throughout the wharf and enjoy the terminal building as a public amenity. The western edge of the wharf will not only accommodate future ferry terminal expansion (with associated pedestrian movements), but offers sunny and potentially protected vantage points for viewing activity within the water space between Queens and Princes Wharves. Given the need to establish a secure zone along the eastern edge of the wharf during cruise ship visits, the western edge in contrast offers opportunities for uninterrupted public engagement with the water, possibly including access to the water, temporary berthing for leisure craft, etc. In addition to temporary berths for leisure craft, the northern end of the wharf has the potential to be developed as a ceremonial space of arrival from the sea. However, any development of the water space at the northern end of the wharf would need to take account of shipping movements. The offering of authentic experiences that reveal our history, geography and cultures is a key factor in New Zealand’s strong global position as an attractive visitor destination. For some of these visitors Queens Wharf will become an important point of arrival and departure. The development of the wharf should make authentic references to its setting and its history, recognize that the wharf is built structure rather than a natural landform, and avoid overt and superficial references or themes. Design integrity will therefore be important in responding to this key issue. The existing wharf is a large and relatively undifferentiated horizontal surface. Opportunities for the public to move to higher and lower vantage points could significantly enhance the visitor experience of the wharf. Provision of shelter will be critical both for creating inviting conditions and for all-weather use of the wharf. Effective shelter will require both horizontal and vertical protection. However, extensive areas of permanently sheltered open space potentially limit the use of such spaces in a variety of ways. The provision of structures capable of supporting temporary canopies and screens should be considered. While some activities and events will require marquees and similar purpose-specific enclosures, the ability to readily create sheltered spaces at minimal cost will be important in attracting a variety of public activities to the wharf. This will be particularly so where risk management of weather conditions and cost parameters are critical. Event promoters typically seek to create settings specifically tailored to the particular event and will thus wish to temporarily transform a part of the wharf. The wharf open spaces will need to be intrinsically adaptable in order to enable such temporary transformations, quite apart from the flexibility which comes from repositioning or adding elements. Some types of event or performance will require spaces in which natural light can be reduced or excluded. The wharf should remain inviting for pedestrians during periods of intensive vehicle movement associated with cruise ship terminal operations. It will also be important to provide conveniently located vehicle drop off facilities for the existing ferry terminal should the current drop off area become unavailable. 3.14 RWC and the progressive redevelopment of Queens Wharf The panel considers that preparation of the wharf for the RWC event should represent a positive contribution to the longer term development, and not simply a temporary measure in order to meet RWC deadlines and requirements. I look forward to the next stage of this interesting process. Each entry must present 4 x A1 sheets, by noon 23rd October, as far as I understand.